The project is funded by the Research Council of Norway under the program Independent projects (FRIPRO) for Social Science–FRISAM (now renamed to Humanities and social sciences–FRIHUMSAM). It’s official start-up date is 01.01.2015 and will run for 4 years. The main focus of this research project is: how do changing land tenure policies affect cooperation and social organisation? The appropriateness of transforming commons to private pastures has been contested, mainly because of its potential to exacerbate the problem it was introduced to counter, i.e. rangeland degradation. Previous studies have been predominantly based on single case studies and focused on the ecological consequences of land tenure changes alone. This project rectifies this situation by embedding a systematic comparative analysis of the causes and consequences of privatisation in a comprehensive theoretical framework of cooperation and social change. This is achieved by comparing current land tenure changes in Norway and China and investigating its impact on nomadic pastoral social organisation. The cause of land-tenure changes will be investigated by systematically reviewing the underlying policy with a specific focus on understanding how two diametrically opposed political systems result in similar policy implementation. The social consequences of privatisation will be investigated by recreating both historical and current cooperative networks, i.e. the siida system (Norway) and the ru skor system (China). The project will utilize different degrees of privatisation as quasi-natural experiments where experimental economic games will be performed to investigate the extent and possible transformation of cooperative structures, both within- and between-regions. Privatisation may negatively impact individuals’ ability to change groups. The ability for individual to change groups is an important factor underlying the evolution of egalitarian social groups. By combining empirical data pertaining to the ability to change groups with theoretical modelling techniques (e.g. agent-based modelling) the project aims to shed light whether groups have become or are becoming more hierarchical. Privatisation has been described as turning pasture into land, a process that represents a threat to collective existence. 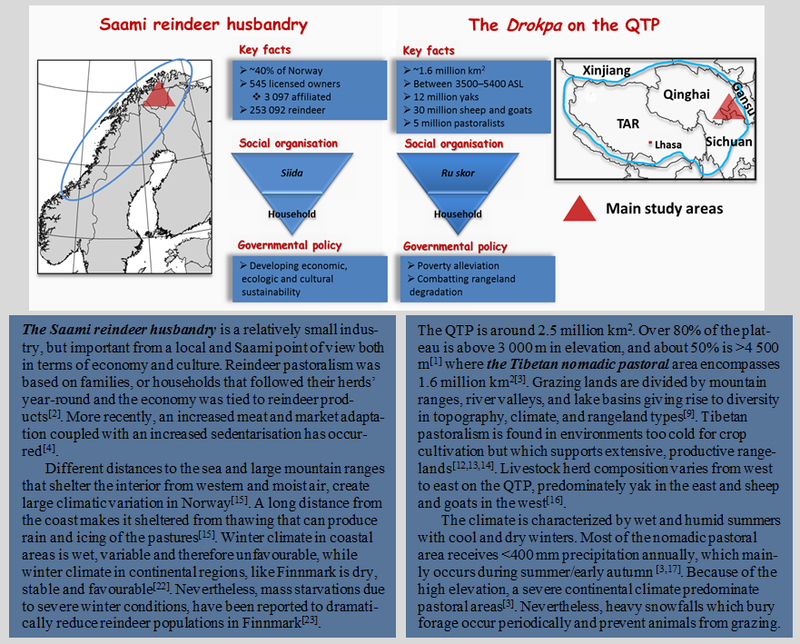 The overall aim of the project is thus to asses to what degree privatisation affect pastoral social organisation through a comparative study of Saami reindeer herders in Norway and Tibetan pastoralists on the Qinghai-Tibetan Plateau, China (QTP, Figure 1). By combining a comparative approach with a case study approach, the project aims at developing both a detailed – case based – description of the process of privatisation and its consequences in both systems and a general theoretical explanation of transformation of social systems. Figure 1. A brief description of nomadic pastoralism in Norway and China. To assess how privatisation affect pastoral social organisation through a comparative study of Saami reindeer herders in Norway and pastoralists on the Qinghai-Tibetan Plateau, China. Different forms of pastoral land tenure and the underlying rationale for privatisation. How cooperative groups form and reform, how often membership change and why individuals leave, join or re-join groups. The status of cooperative groups at present, if cooperation has decreased due to privatisation, if traditional groups are still predominant arenas for cooperation and if the level of conflicts have increased or not due to privatisation. If privatisation have restricted possibilities outside established groups and if groups have become/are becoming more hierarchical. If cooperation is gendered, if men and women have different cooperative networks & if gendered cooperative networks are differentially impacted by privatisation.